Welcome to Part 1 of an ongoing series about how I integrated the Synology DS1517+ into my personal photography workflow. I've already talked about the general pros and cons of NAS solutions in a previous post and why I think the products from Synology are a real game-changer for your content management. This series will dive into more details about how I integrated the DiskStation into my very own photography workflow. I'll split this up into several posts, covering local and remote scenarios. In this part I'll talk about how to use Adobe Lightroom together with the DS1517+ within a local network. This is followed by how you can use Synology's USB Copy package to create a local back-up on an external USB drive. Note: To keep this post in a reasonable size, I'll only explain how to set up the DiskStation for usage within your local network. Configuration via HTTPS/VPN, using cloud services for backups and how to access the DiskStation from the internet will be covered in upcoming posts, as these topics are quite comprehensive. Let's face the reality: For most of us photographers/content creators a Synology DiskStation serves the main purpose of being a mass storage solution for the sheer masses of our digital content. In fact, a lot of people I know just use their NAS as a big backup disk, switching it on once in a while to sync their productive portable disks on it. While there's absolutely nothing wrong with this approach, your Synology DiskStation can do much more for your daily workflow than just offering a huge storage potential. The above graphic illustrates my current setup for managing content in a simplified manner. The DiskStation contains all my RAW files and represents a centralized access point for all consuming devices. When running Adobe Lightroom on my MacBook Pro, I usually mount the DS1517+ as a network drive via SMB protocol (Server Message Block). Alternatively you can use Apple's own protocol AFP (Apple File Protocol). This allows you to access content on your Synology DiskStation via the Mac Finder (or Windows Explorer) like local files on your hard drive as long as you're in the same local network. To get this working, we first need to configure some things on the NAS by using the DSM operating system. Like already mentioned above, in order to get access to the file structure of the DiskStation, we need to enable a specific file service based on SMB or AFP. Personally, I use a MacBook Pro, running the latest macOS High Sierra version on it. That's is why I chose SMB as a protocol for this, being the general recommendation. If you're using a Windows machine, the following technical steps should be similar but you might have to look up on how to enable specific settings in Windows itself. Before we start, please make sure, that your DiskStation and working machine are connected to the same local network. Note: I blacked out some fields due to security reasons. Please open the Control Panel from your DSM desktop and navigate to the File Services tab. Once the page opened, you'll see specific sections for the different protocols. Please enable the checkbox next to Enable SMB service and leave everything else untouched. You'll also see a light blue box containing information on how to access your folders by either using macOS or Windows. Make sure to copy or write down the appropriate address, because we'll need it in a minute. When done, hit the Apply button on the lower right. Now let's switch to the Finder in macOS and hit CMD + K to open the Connect to Server dialog. When the dialog is open, please paste the address from the previously shown DSM SMB/AFP settings window in it. This should be smb:// followed by either the name of your DiskStation or its IP address. After that hit the Connect button at the bottom. A new dialog will pop up asking for your Synology DiskStation user credentials. 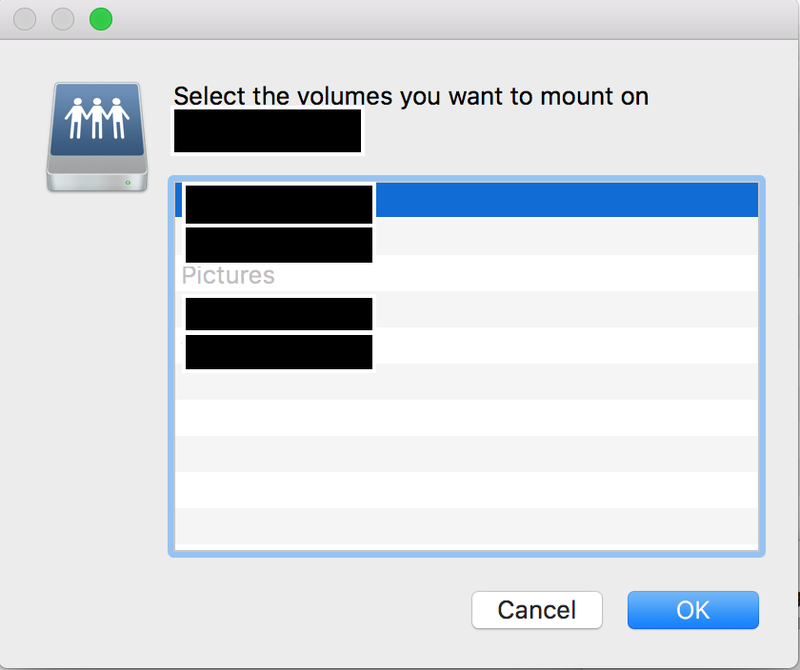 Please enter the credentials of one of your DiskStation users, keeping in mind that this user must have read/write permissions on the Shared Folder you'd like to mount on your MacBook. (This can be managed within the DSM Control Panel's Shared Folder tab for each folder individually). Pressing Connect will lead you to a new window, which allows you to choose a Shared Folder on your NAS for mounting on the MacBook. In case of this scenario, this should be the folder containing all your RAW images you want to access via Adobe Lightroom. Hit the OK button and the folder will be mounted right away. Like in the screenshot above, we now can see the mounted folder (in my case Pictures), when clicking on the MacBook device icon, like any other locally installed or connected drives. The Shared Folder can now be accessed from Adobe Lightroom, like any other folder on your MacBook. If this is the first time accessing it, please click on the little + icon next to the Folders tab and select Add Folder from the menu in order to add it to your Adobe Lightroom catalog. Note: Your Adobe Lightroom catalogs and related preview files (.lrcat, .lrdata) should always remain on your local machine and not on the DiskStation itself. Not only has this several perfomance advantages but Adobe doesn't allow multi-user access to a catalog, therefore isn't supporting opening catalogs from network drives. There are some workarounds existing in order to get this working but I advise you to keep them local at all times to avoid possible integrity problems. In a future post I'll show you how to backup these files to your NAS easily. When opening Adobe Lightroom, it'll indicate missing folder structures with a question mark next to the icon folder. In addition to that, each missing file will have a small exclamation mark in the top right corner. Go ahead and right-click on the top-level folder, which is indicated as being missed to open the context menu. Once it's open, please click on Find Missing Folder and then navigate to the moved top-level folder, which should be located within the mounted Shared Folder of your DiskStation. After you click Choose, Adobe Lightroom will re-reference all missing folders and files to the new location on your NAS. Sometimes this step has to be repeated for underlying, deep folder structures. Once you referenced all the folders you're good to go, working with Adobe Lightroom in the local network and accessing the DiskStation without any cables at all. Sometimes it's not possible to access the DiskStation or you just don't want it to be running 24/7. In this case you most likely want to fall back on a portable hard drive. Additionally, we've already learnt, that you should always have at least one complete back-up next to your working setup. Assuming you're working with the above DiskStation setup from now on, you'll need a complete copy of your RAW folder structure on a second device, which always stays in sync with changes made to any file on the NAS. 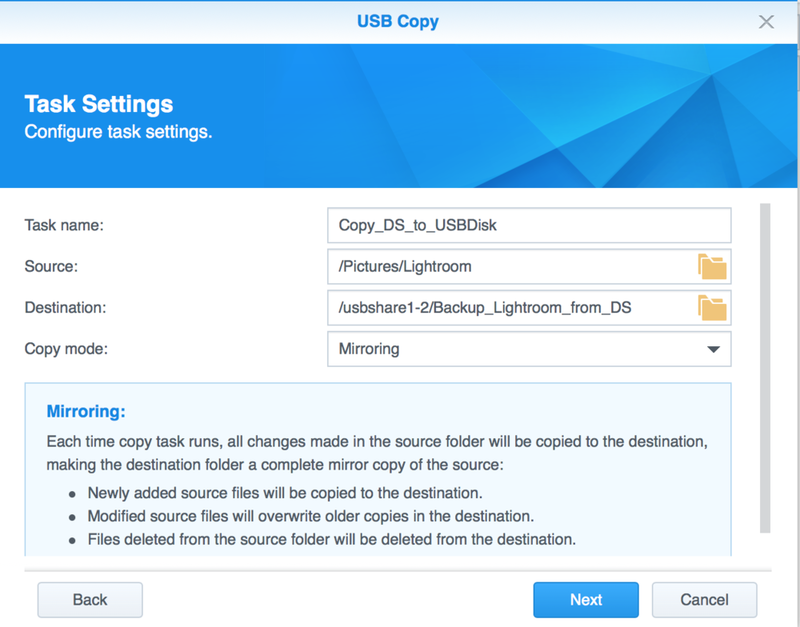 Thankfully, Synology offers a DSM package called USB Copy, which will make this whole process a breeze. It helps you to copy files between your DiskStation and any external USB storage device. Go ahead and install this package on your Synology device. We'll now continue to create a copy task, which copies all changes of a given folder structure from the DiskStation to an external USB hard drive. Whenever this drive gets plugged into the NAS via USB, this task will be triggered. This means, that every time when this task was performed, we have a complete copy of all RAW images on the external drive. This drive can then be stored offsite or be used while traveling, etc. Please plug the USB drive into your DiskStation and open the USB Copy application. The first time you open USB Copy, you'll be asked which type of task you want to create. In this case, please choose Data Export and hit the Next button, which will lead you to the task settings. Please give the task a specific name, which makes it easy to identify later. After that, you have to navigate to the source folder, which you want to copy to the external disk, followed by the specification of your destination folder, right on the USB drive itself. When done, please select Mirroring as copy mode from the drop-down menu. This ensures that you'll get a complete mirrored copy from your selected source folder at all times. When everything is provided, hit the Next button please. Here you can specify the trigger time, which can be event or time based. In my case I decided to copy all changes whenever I plug in the USB device to my DiskStation and that the external drive shall be ejected, once the task is completed. If you prefer a time based triggering, feel free to provide the necessary information, like on which days and time the task shall be performed. Once everything is in place, press Next again to specify the a file filter for your task. Personally, I keep everything enabled here but you might want to choose only specific types of files to be copied to your destination drive. Once this is set to your taste, hit the Apply button to finish the task setup. Note: You now have set up a task for mirroring your DiskStation files to an external device, which is your first step into a proper backup strategy. You can do this for several drives and also into the different direction (copying from an external disk to your NAS). I'd suggest you to store one external mirrored drive at another location than your DiskStation, to prevent any risk of data loss. There is plenty more that can be done, including backups to cloud services, which will be a topic for one of the future tutorials. Thanks for following along and stay tuned for the upcoming post, talking about remote scenarios for the Synology DS1517+.